Whisked away from his comfortable, unambitious life in his hobbit-hole in Bag End by Gandalf the wizard and a company of dwarves,Bilbo finds himself caught up in a plot to raid the treasure hoard of Smaug the Magnificent, a large and very dangerous dragon. Although quite reluctant to take part in this quest, Bilbo surprises even himself by his resourcefulness and his skill as a burglar! Written for J.R.R. 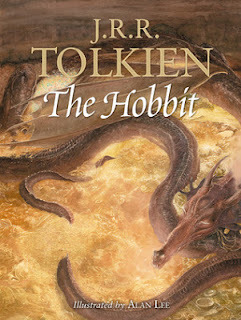 Tolkien's own children, The Hobbit met with instant success when published in 1937. Jake's Review: Would have been higher rating but the man just had way too much detail and his sentences were like 500 words long. Liked that the characters from the Lord of the Rings (e.g. Gandalf, Elrond, etc) were in the Hobbit. I watched The Lord of the Rings trilogy with my parents so I was familiar with many of the characters. I like the fantasy of the story with all the made up creatures and places. My favorite character was Bilbo because even though he was a wimpy, lazy guy he became brave and fought creatures bigger and stronger than he was. Gollum is one serious creepy dude (and Mom thinks she can do a Gollum voice but she can't - please make her stop) I think Aidan would really like this one. Mom's Review: Jake and I decided to read this one together - in other words - I read a chapter out loud to him every night for almost a month. An absolutely delightful fantasy tale that I highly recommend everyone to read. That being said -- oh my god -- Tolkien is the "King" of the run on sentence. Reading it aloud was excruciating at times, I never knew when to breathe. Not to mention the shear amount of times he went off topic. It truly drove me nuts at times. It took us a while to get into it but about a quarter of a way in we were hooked and couldn't wait to read it each night. The dialogue between Bilbo and Smog was worth each and every run on sentence. The sheer amount of creativity put into this story is awe inspiring!!! Will be interesting to see what they do with the movies. Best part was reading it with Jake every night, a truly wonderful bonding experience.